Gionee S11 Lite Price in India is Rs.9990 for 4GB/32GB variant. The Gionee S11 Lite is powered by 1.4GHz octa-core processor and it comes with 4GB of RAM. The phone packs 32GB of internal storage, 5.70-inch touchscreen display, 3030mAh non removable battery, 13-megapixel primary camera on the rear and a 16-megapixel front shooter for selfies. No coupon code needed. Shop now! Gionee is once again setting a sight on the Indian smartphone market. The company has changed its strategy and is going after the offline market share. 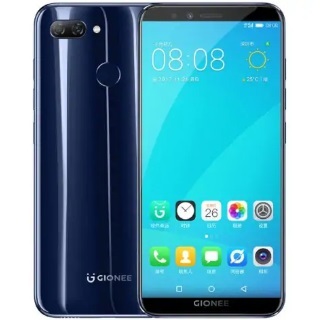 The Gionee S11 Lite was launched in India back in April 2018. It is a modern-day phone with a bezel-less display and dual rear camera setup. The phone looks flashy and makes a style statement. It comes with decent specifications compared to its pricing as well. So let us check out the Gionee S11 Lite review to find out if you should purchase this smartphone or give it a miss. However, do take a look at the specifications of the mobile first. The Gionee S11 Lite runs on Amigo OS 5.0 based on Android 7.1.1 Nougat OS and is powered by a Snapdragon 430 octa-core processor and 4GB RAM. The phone boasts of a 5.7-inch HD+ display and packs in a 3030mAh non-removable battery under its hood. There is 64GB of internal memory onboard and you can also expand it further up to 256GB. In the camera department, we get a 13 megapixel primary camera and a 2 megapixel secondary camera at the back along with a 16 megapixel selfie shooter. There is a fingerprint sensor at the back. The S11 Lite has 4G VoLTE connectivity along with Dual SIM support. Other options include 3G HSPA+, WiFi 802.11 b/g/n, Bluetooth 4.2 and GPS. The Gionee S11 Lite features a lot of sensors such as gyroscope, magnetometer, accelerometer, ambient light and proximity sensors. The Gionee S11 Lite is a premium budget smartphone with a unibody metal construction along with glass back. The build quality is great and the overall finish looks very premium. The bezel-less display looks very good and feels modern. It has a mid-sized display and you can use it with one hand. The phone does not weigh a lot and feels quite light. You will get used to the weight easily and can use it for long duration without any stress. The curved edges around the corner gives it a good grip. The glass back is a bit slippery and thus we would suggest you to use a protective case. However, it looks stunning, specially in blue color. Starting with the front side first, there is a 5.7-inch display along with the selfie camera, LED flash, couple of sensors and earpiece on top. The phone comes with on-screen navigation buttons and hence we do not get any capacitive buttons. At the bottom, we have the microUSB port, primary microphone and loudspeaker while the 3.5mm headphone jack and secondary microphone are located at the top. The volume rocker and power/lock button are on the right while the left side has the SIM and microSD card slots. Turning towards the back, we have the dual rear cameras sitting on the left top, followed by the LED flash on the right and a fingerprint sensor below. The Gionee branding is found at the bottom. The back cover is non-removable but a 3030mAh battery (non-removable) sits underneath the hood. Overall, the Gionee S11 Lite is a good looking smartphone with a stylish design and comes with decent specifications. The Gionee S11 Lite packs in a 5.7-inch IPS display, which has a resolution of 1440 x 720 pixels (HD+). The display is quite tall but the phone does not feel too big due to the high screen-to-body ratio. However, the resolution is on the lower side as we get Full HD+ displays in this price segment. Regardless, it is a bright display with good viewing angles. The colors are sharp and vivid. The brightness and contrast levels are decent. The images, texts and videos look quite crisp and vivid. The sunlight legibility of the display is quite good as well and since it comes with an ambient light sensor, the brightness gets adjusted automatically according to the surroundings. The FullView display has become common these days but it still looks very good and users love to view high-definition content on it. We do not get a branded screen protection on top of the display but there is 2.5D curved glass, which is able to protect the display from daily wear and tear. The touch response of the S11 Lite is quite smooth due to the curved glass display and fluid interface. Overall, the Gionee S11 Lite has a FullView display which looks very modern and is tailor-made for content consumption. In terms of performance, the Gionee S11 Lite is powered by a Snapdragon 430 octa-core processor along with 4GB RAM. It is a mid-level chipset and hence it can handle most of the day-to-day processes without showing any stuttering. Most of the popular apps and games load up fairly quickly but heavy apps and games face some lag and frame drops. The 4GB RAM provides a very good multitasking experience and you can perform intense multitasking by running more than ten or more apps simultaneously. We did not face any visible UI lags as well but occasionally there was some stuttering here and there. When it comes to gaming, most of the high-end games will run without any fuss but a few of them might not support the highest graphics settings. The S11 Lite comes with 64GB of internal memory, out of which around 52GB of free space was available after first boot. You can increase it up to 256GB by adding a microSD card but we get a hybrid slot, so you will have to sacrifice a SIM slot. There is a fingerprint sensor located at the back and it is very quick and accurate. Talking about connectivity, the S11 Lite from the house of Gionee supports Dual SIM (nano) and is of course 4G VoLTE enabled. Both the slots are 4G enabled but simultaneously only one slot can be used for 4G while the other will work on 3G. The 3030mAh battery (non-removable) under its hood will give you up to one day of battery life with moderate usage but there is no fast charging support. Hence, you will have to spend more than two and half hours to charge it fully from 0-100. Overall, the Gionee S11 Lite is a good performer but we miss fast charging here. The Gionee S11 Lite features a dual camera setup at the back – there is a 13 megapixel primary camera along with a 2 megapixel secondary camera. Like most other smartphone cameras, the S11 Lite can click very good images in natural outdoor lighting and the pictures have a lot of details in them. The color saturation is on the neutral side and the photos look quite sharp. The colors are bright, vivid and they look quite natural. Now coming to the low light environments, the images have a lot of noise and they lack details too. The second lens is used for clicking portrait images but the quality is not so great as we only get a small 2 megapixel sensor. In great outdoor lighting, you will be able to click decent portraits. The focusing is quite quick and accurate as well. HDR photos look beautiful due to good dynamic range and is the best mode for clicking landscape images. Macro shots have a lot of bokeh effect too. There is a 16 megapixel selfie camera on the front that can take very good selfies. You can even click selfies in dark low light conditions as it comes with a LED flash. We get Face Beauty 2.0, Beauty mode in videos along with a lot of filters and effects to make your selfies and selfie videos look even better. The camera app of the S11 Lite comes with a clean interface and is very easy to use. It comes with various shooting modes including a pro mode for mobile photography enthusiasts. However, we would suggest you to use the Auto mode as it works for most lighting conditions. Both the camera setup can shoot Full HD videos and the quality is good. Overall, the Gionee S11 Lite has a good set of cameras but portrait mode is not the best. The loudspeaker cutout of the Gionee S11 Lite is located on the right bottom of the device. It sounds loud and the quality is also very good. Also, there is no distortion at the highest volume levels. Since the speaker is placed on the bottom, the sound gets muffled when the phone is held for playing games or videos. We get a native music app and it comes with all the necessary features. Thus, you do not have to download any third-party app for optimal music performance but you can surely download an app like Saavn to stream songs online. Now coming to the video watching experience on the S11 Lite, you can play both HD and Full HD videos without any problem but it might lag a bit with Ultra HD or 4K videos because of the processor. It does come with an earphone but it is above average in quality and hence we would suggest you to get a good set of earphones to get the best audio experience. Overall, the Gionee S11 Lite offers a good audio and video experience. The Gionee S11 Lite runs on Amigo 5.0 based on Android 7.1.1 Nougat OS out of the box. However, you should not expect the device to get Android 8.0 Oreo OS update in the future since most budget smartphones do not get any major update. Talking about the performance of the interface, it is quite fluid and smooth for most of the tasks and processes. We did not feel any lag or stuttering during our general day-to-day usage. Amigo OS feels more or less like iOS but it has improved a lot compared to its last two iterations. You can customize a lot of features but we also get all the major Nougat features as well. There are some pre-installed apps (bloatware) but you can easily delete them if you do not want to use them. In case you do not like the look and feel of the Amigo OS, you can then download any third-party theme like Pixel Launcher to get a more sophisticated look. Overall, the Gionee S11 Lite has a fluid interface with lots of features. The Gionee S11 Lite is a modern smartphone for sure as it comes with a beautiful, bezel-less design. The display looks good but it would have looked better with Full HD+ resolution. The software is stable and fluid but the battery life is average along with no fast charging support. The multitasking experience is good and the overall performance is also good. The camera department is capable of taking good images but the portrait mode is average. So if you want to purchase a Gionee smartphone in this budget, then go for the Gionee S11 Lite. However, if you’re looking to check out the competiton, then have a look at the Xiaomi Redmi Note 5 Pro, Honor 9 Lite and Vivo Y83.